This has been a great couple of weeks for science at Vivid Vision. Our home in San Francisco puts us close to many institutions of higher learning, including the School of Optometry at UC Berkeley and the Ophthalmology departments at UCSF and Stanford. Less well known, perhaps, is the outstanding vision science going on at UC Davis, the University of Nevada at Reno, UC Santa Cruz, and San Jose State, NASA Ames. These folks converged on two events this month: the annual Bay Area Vision Research Day at UC Berkeley on September 14, and the Fall Vision Meeting of the Optical Society of America at UN Reno on September 21-23, which is a much more international meeting. I’m driving home from Reno to Oakland and I’ve stopped by a stream in the Sierras, near Verdi, to write this dispatch. My name is Ben Backus and I am the Chief Science Officer at Vivid Vision. I got my PhD at Berkeley in binocular vision, way back in 1997, followed by a postdoc at Stanford. It’s less than a year since I left my full-time job (with tenure!) as a professor at SUNY’s College of Optometry to join Vivid Vision, and presenting at meetings like these is one way we plan for me to stay connected with the field. At Berkeley my half-hour talk was titled “VR for vision testing and treatment” and it covered our approach to testing and treating disorders of binocular vision, as well as a new test we’re developing for visual field testing (also known as perimetry). At Reno, I had a poster and demo focusing on the perimetry project, which was a lot of fun, and a really good way to get feedback on this new product. For the demo, I used a Facebook Oculus Go. I forgot to keep my camera handy, but you can see one I took of Kim, Rowan, and myself at the end of the session above. One learns a lot at these meetings, especially from old-timers. There was a lot of very good science about how to do visual field testing in the 1970’s that we’re incorporating (along with our own ideas and the latest and greatest) into the perimetry test. I can definitely say that one learns a lot at these meetings, especially from old-timers. For example, perimetry is currently done using small spots of light with crisp borders. But if you use dark spots with blurred borders, you can avoid scattered light in the eye, which is a problem because it makes targets visible when they are presented in areas of blindness (scotomas). Blurring the spots make the test robust to refractive correction errors because optical blur doesn’t make them much blurrier. Both meetings were non-stop outstanding vision science. It’s not really possible to summarize the highlights, but I’ll give a few examples. At Berkeley, Professors Will Tuten and Austin Roorda (both from Berkeley) described how they’re testing retinal circuitry: by sending light into the eye to stimulate single cone photoreceptors, one at a time! There are 100 million of these in each eye and they are packed very close together. The idea that you can ask a person what they see when just one photoreceptor is stimulated–it’s incredible. Someday we’ll make use of this technology to stimulate corresponding points in both eyes at once, to really control the correlated binocular input that the visual system needs during vision therapy. In Reno, Professor Rowan Candy (U Indiana, Bloomington) reported on her lab’s work in infants: contrary to what’s been taught for decades, infants as young as a few weeks have robust, adult-like accommodative responses, and by two months of age their vergence systems are responding well in prism tests. This is Herculean work using equipment that Dr. Candy invented specially for this purpose. On the one hand, this work shows the value of detecting binocular vision disorders very early, because young infants are already learning. On the other hand, my take-away given that many adults with stereo-depth deficiency can recover stereopsis late in life, is that while Dr. Candy's work shows that the wiring for binocular vision is present very early on, it also remains in place for many individuals who do not receive optimal visual experience during infancy for training their binocular vision systems. 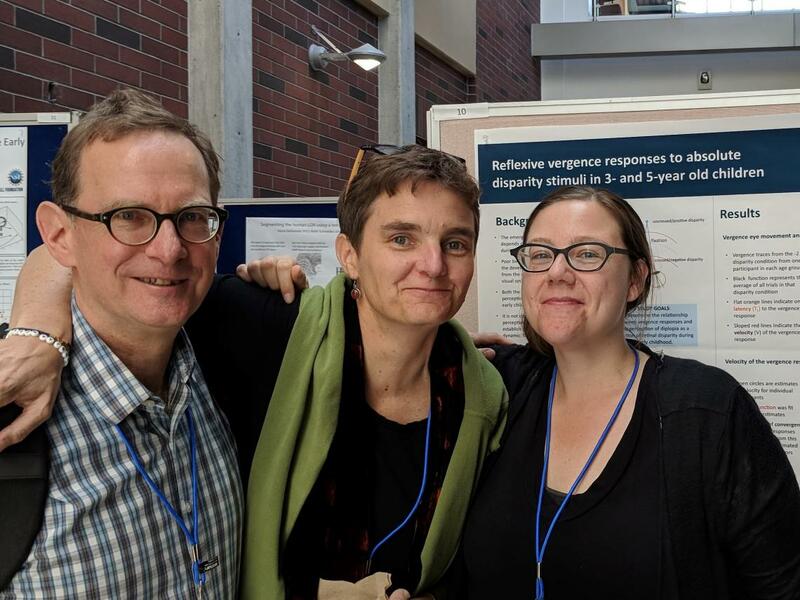 Time to give a bit of credit where it’s due: we’ve been collaborating with Dennis Levi at Berkeley and Daphne Bevalier at Geneva on the binocular vision project, along with others. On the perimetry project, we’ve been collaborating with Bertil Damato and Michael Deiner at UCSF, along with others. So it’s pretty sweet for me to be at Vivid Vision—all these great collaborators, plus our home team of vision therapists and optometrists. I tell my scientist colleagues that working with our CEO (James) and CTO (Manish) is like having outstanding graduate students in my lab--except that I work for them, rather than the other way around!